Attorney Jeremy Walker, representing Northern Pass, questions John Petrofsky, who grew up in Stewartstown and now lives in Washington, DC at Thursday’s adjudicative hearing before the Site Evaluation Committee on the project. CONCORD — With Hydro-Quebec’s agreement to bury 11 miles of the Northern Pass transmission line in Canada, so should the line through the 40 miles of new right-of-way in the North Country, the Site Evaluation Committee was told Thursday. The projected cost of burying the 11 miles in Canada would project to be $4.2 million a mile in U.S. dollars, said John Petrofsky who grew up in Stewartstown, owns property there but lives in Washington DC. About eight miles of the transmission line will be buried in the new 40-mile, far northern section of the $1.6 billion, 192-mile line to bring 1,090 megawatts of Hydro-Quebec electricity to New England. Northern Pass said burying more of the line in the 40-mile section or in other sections of the proposed route would make the project economically unfeasible. A total of 60 miles will be buried including 52 miles from Bethlehem to Bridgewater including through the White Mountain National Forest. 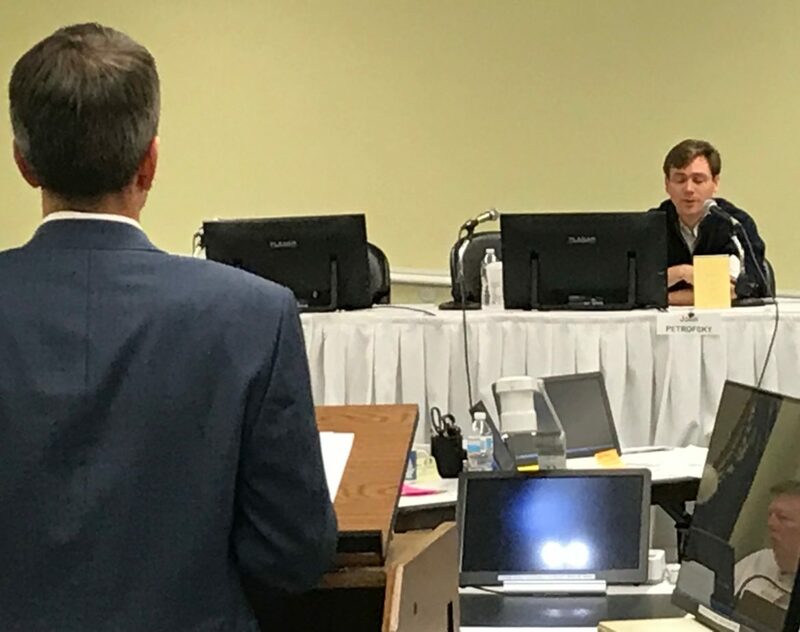 But attorney Jeremy Walker representing Northern Pass questioned whether Petrofsky had done enough research to make the claim it would be economically feasible to bury the line for the 40-mile stretch, noting Petrofsky’s expertise is in finance not engineering. Where would the line be buried in Canada, Walker asked, and Petrofsky said along shoulders of roads as the EPA had proposed in the northern New Hampshire section. Walker asked if Petrofsky knew if there would be any horizontal directional drilling in the Canadian section and he said no. Petrofsky said he assumed it would be similar to the terrain it connects with in Northern New Hampshire. Petrofsky also was concerned the project would have a negative impact on the Cohas Trail which covers 170 miles through Coos County. He said the proposed transmission station in Stewartstown and the project’s towers will be visible from the trail in a number of places. He said it helps the North Country economy and the project would change people’s experiences as they hike the trail. The committee also heard from North Country landowners opposing the project, as well as others who do not abut the transmission line, but who believe the project will adversely impact their views, as well as members of the Pemigewasset River Local Advisory Committee. Witnesses are scheduled to testify before the committee through Tuesday and possibly into Thursday with remaining dates used to review exhibits submitted by the applicants and intervenors. Intervenor legal briefs have to be filled by Jan. 12 and the developer’s briefs by Jan. 19. The committee begins public deliberations Jan. 30 and continues through the end of February when it must make a decision. Eversource had hoped to have all federal and state permits by the end of this year with construction beginning next year and the transmission line finished by the end of 2020.